One of the more upright flowering pear trees is Pyrus calleryana ‘Capital’. This is a tall growing deciduous tree to around 11m in height with a spread of 2-3m. Its narrow (fastigate) growing habit making it ideal for narrower spaces including suburban yards, commercial developments, screening and as a street tree. Attractive glossy green heart shaped foliage with a good autumn color and masses of pink tinged white flowers in spring. Although deciduous Pyrus calleryana ‘Capital’ does lose its foliage late in the season and flowers early. Growth rate is medium to fast, however yearly growth rate will vary depending on soil, position, climate, temperature range in seasons and year round weather. They are also likely to grow quickly after a year or two ‘settling in’ and them slow toward maturity. Not known to be a weed problem or self seed. Once established these are a reasonably drought tolerant and hardy deciduous tree requiring little pruning or maintenance. A sunny position in a humus rich moist, but well drained soil is best. when planting out it is advisable to provide support until a good root system is established. Pyrus calleryana ‘Capital’ is disease resistant and if provided with a cool root run will put on strong growth after its first year. They seem to cope well with compacted soils and do not seem prone to drop large limbs. Specimens of 2 – 3 m seems to transplant well with watering through the first two summers and or dry spring periods. Flowers are prolific, however their fragrance is not overly ‘attractive’. Although reasonably tolerant of poor soil, they do require some moisture in summer to perform well and achieve a good growth rate. They have thin or fragile bark, so best not planted where they may be brushed by vehicles. You need to check specimens to ensure that they have been grown to have a strong central leader. Pyrus calleryana ‘Capital’ are not suited to growing under power lines. 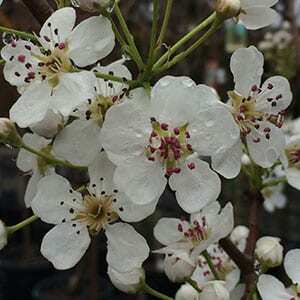 Pyrus calleryana ‘Capital’ is available for sale from the following wholesale nurseries.